Mario Draghi is letting the numbers do the talking. After five weeks of silence, the European Central Bank president is leaving it largely to a raft of economic data to fine-tune policy expectations ahead of the Governing Council’s next meeting on Sept. 8. Reports covering inflation to business confidence and unemployment in the coming days may signal whether more stimulus is needed to sustain the recovery and revive price growth amid potential fallout from Britain’s vote to leave the European Union. Momentum in the 19-nation euro area has so far shown few signs of losing pace, and economists at both JPMorgan Chase & Co and Danske Bank A/S pushed back projections for further easing. But executives in Germany, the region’s largest economy, are beginning to wake up to the Brexit shock, suggesting that more severe consequences may still be ahead. Draghi didn’t attend this year’s gathering of central bankers and economists at Jackson Hole, Wyoming, at the weekend, where Federal Reserve Chair Janet Yellen said the case to raise U.S. interest rates is getting stronger. Two years ago, he used the same event to flag a major policy shift that ultimately saw the introduction of quantitative easing. Now, the ECB president is deferring judgment of the euro area’s economic prospects before fresh staff projections are published. Draghi’s analysis of the risks attached to them may shed light on his plans for monetary policy in the months to come. Executive Board member Benoit Coeure did attend Jackson Hole, and warned that policy makers “may need to dive deeper into our operational framework” if governments don’t act to boost growth potential in euro-area economies. Even so, he has previously warned of the risks from the side effects of ever increasing stimulus. The ECB’s chief economist, Peter Praet, and Governing Council members Francois Villeroy de Galhau and Ewald Nowotny are all scheduled to speak this week. The most awaited piece of data in the coming days is probably inflation. Euro-area consumer prices are barely rising despite 1.2 trillion euros ($1.3 trillion) of bond purchases and a negative deposit rate, and policy makers agreed at their July 20-21 meeting that no clear upward trend in inflation was yet visible. Economists surveyed by Bloomberg predict the rate rose to 0.3 percent in August from 0.2 percent the previous month. 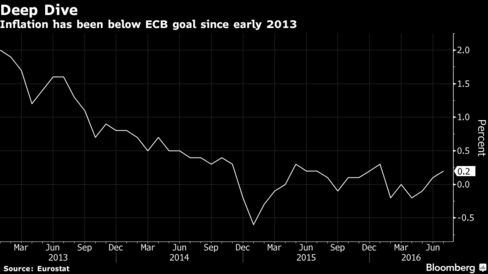 That would be the highest since January but still far from the ECB’s goal of just below 2 percent. “Draghi has said he wants to make things dependent on the numbers,” said Michael Schubert, an economist at Commerzbank in Frankfurt. As far as inflation is concerned, “every tenth of a percentage point can be a source of hope or despair,” he said. Industry and consumer confidence data out on Tuesday will show how well the economy is holding up two months after the U.K. referendum. Private-sector activity unexpectedly picked up in August, driven by an improvement in services, according to surveys by IHS Markit. But the tide can turn quickly. In Germany, where second-quarter earnings at blue-chip firms beat estimates by more than 10 percent, business sentiment has plunged the most in four years, with executives warning that Brexit and other political crises may damp orders. With an expansion of 0.4 percent, the nation drove euro-area economic growth in the April-June period. In both France and Italy, growth ground to a halt in the quarter. Manufacturing in the region’s second-largest economy has shrunk for six months and tourism is suffering from a series of terrorist attacks. Meanwhile, Italian banks are struggling to dispose of non-performing loans, and a vote on political reform expected in November has the potential to topple Prime Minister Matteo Renzi’s government. Even in Spain, where growth rates have been among the strongest in the region as investment and job creation tick up, risks remain. Acting Prime Minister Mariano Rajoy is facing a confidence vote on Wednesday to secure a second term that, if lost, could put the nation on track for a third election.